#3. 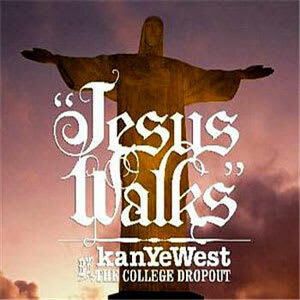 Kanye West "Jesus Walks"
They said you can rap about anything except for Jesus. But Kanye did just that, and made it a smash hit/club banger. Kanye's third, and perhaps boldest, single from The College Dropout was definitely a crapshoot. Can you imagine the meeting at Def Jam when they pitched this idea? "You're going to release a rap single about religion and shoot three videos for it? Suuuure." But 'Ye made the impossible possible when "Jesus Walks" shot to the top of the charts and was praised by critics and fans alike. The pulsating drums, marching-band flavor, and background gospel chants were unlike anything else in hip-hop at the time. It's hard to imagine that countless artists passed on this beat and the track sat in the Kanye archives for years. Then again, it's debatable that any other artist could've done this justice. "Jesus Walks" would go on to win Rap Song of the Year at the 2005 Grammy Awards, proving that dropping a song about Jesus in the oft-secular music industry could be done in a major way. Somewhere DC Talk is pissed.